Have you been working hard all year long? Putting in those extra hours and earning a few extra dollars in the process. Well, it’s time to reward yourself. Instead of placing all that money straight into your bank, why not try using some in a way that’s infinitely more enjoyable? A diamond watch is a perfect way to treat yourself without throwing away your hard-earned cash. As much an investment piece as an accessory, a diamond watch is something you’ll wear for years to come. If you are interested in wearing a slice of luxury on your wrist, here are the best diamond watches for men. 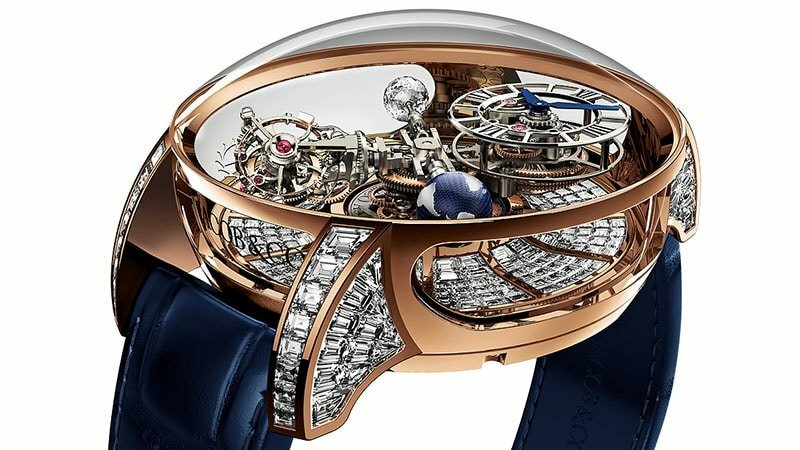 For those who want a watch that will draw envious eyes and start conversions, Jacob & Co.’s Crystal Tourbillon is the answer. The bold timepiece boasts a stunning 18k white gold diamond case, measuring a massive 47mm in diameter and 14mm in thickness, as well as a superb skeletal dial. 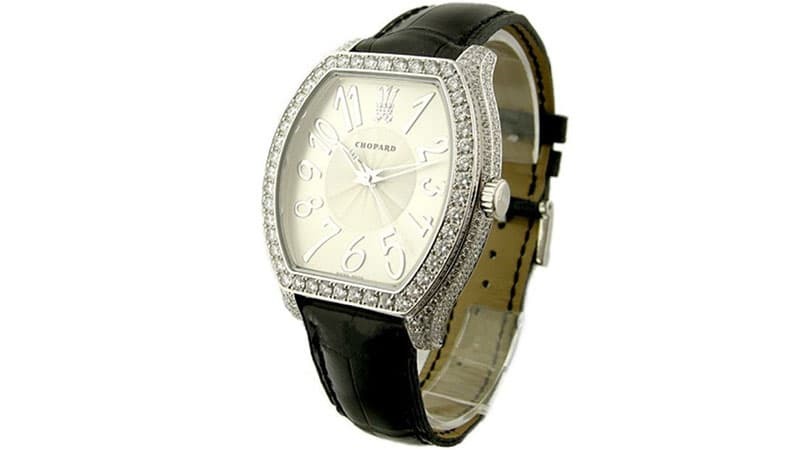 Its fixed 18k white gold bezel is also set with baguette diamonds while its strap is made from luxurious dark leather. 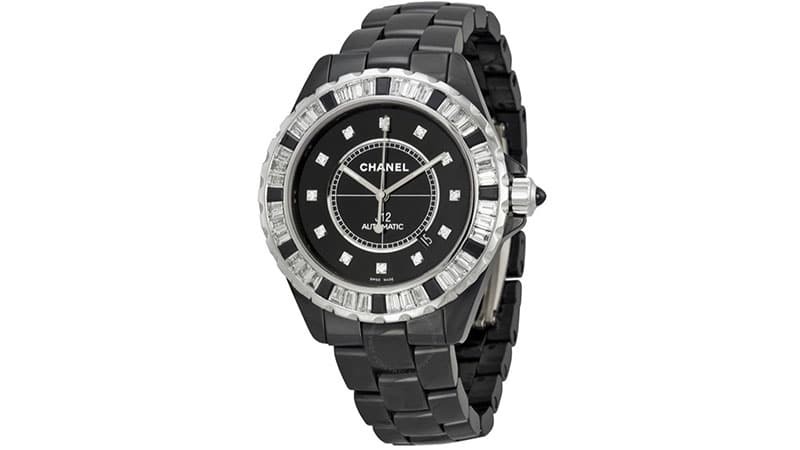 If you’re the kind of gent who favours contemporary designs over classic styles, Chanel’s J12 Watch is for you. Thanks to its dark colour and diamonds, this black watch is both modern and luxurious. It features a black ceramic 42mm case and bracelet as well as a black dial with silver-tone hands. Its unidirectional bezel is made from 18k white gold and is set with baguette diamonds. Featuring a 43mm stainless steel case, blue leather strap, and blue dial, the Ulysse Nardin Executive watch is uniquely stylish. Perfect for gents who enjoy a bold look, the striking timepiece is sure to catch eyes and draw compliments. 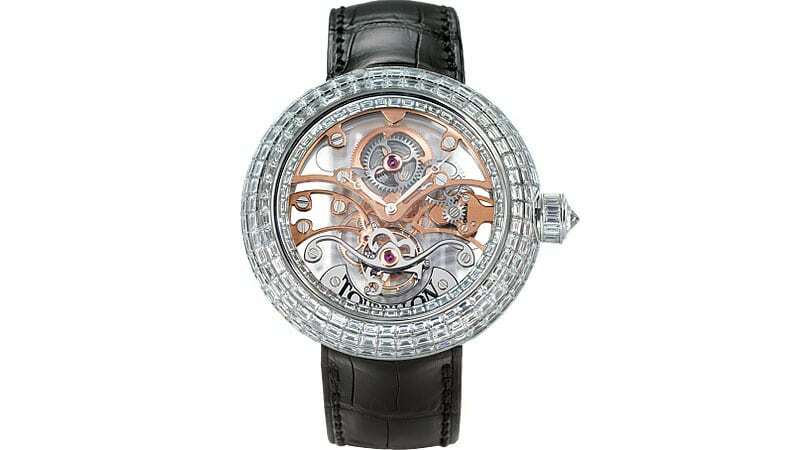 It also features a luxurious diamond-set bezel to complete its statement style. When it comes to function, this automatic watch provides dual time, which is useful for travellers wanting to set a “home” time for quick reference. If you’re after a diamond men’s watch with a point of difference, the Hublot Classic Fusion Tourbillon Watch makes an excellent choice. As well as being a tourbillon, the stylish timepiece is also a skeleton watch, allowing its wearer to view its interior mechanism. On top of that, its 45mm case is made from 18k king gold and its fixed bezel is set with baguette diamonds. Completing its sleek design is a black alligator leather strap. Your wrist is the perfect place to show off a decadent design, and Hublot’s Classic Fusion Diamond Watch is just that. 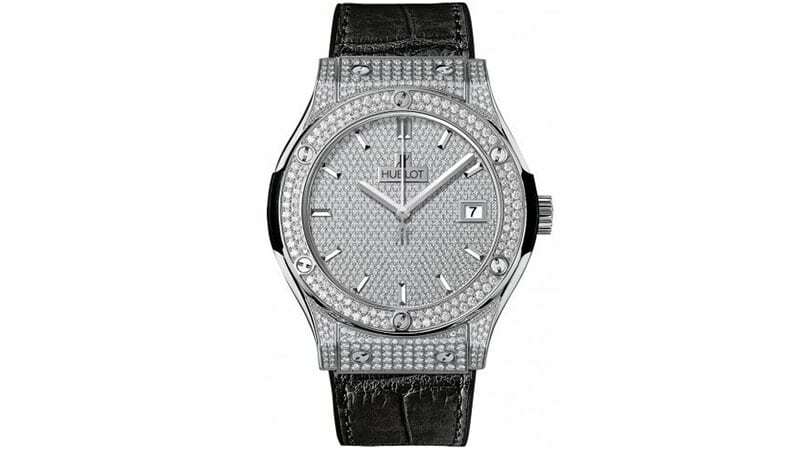 The striking style features a diamond pave titanium case, diamond pave dial and diamond-set fixed bezel. For functionality, the Swiss-made timepiece also boasts an automatic movement, 42-hour power reserve, 50-metre water resistance, and date display at the 3 o’clock position. 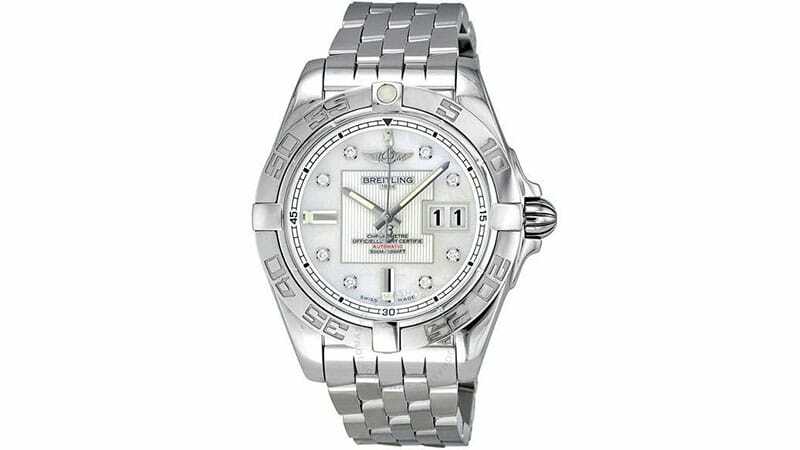 If you’re after a stylish and functional diamond watch, Breitling’s Galactic 41 Automatic Watch is an excellent option. The sleek timepiece features a stainless steel case, mother of pearl dial, diamond hours markers, luminescent hands, date display, chronometer, and 300m water resistance. Thirty-eight baguette diamonds are fixed to the bezel of Patek Philippe’s Grand Complications Celestial Watch, making it a terrific luxury design. Also adding to the timepiece’s statement appearance, as well as its impressive functionality, is a sky chart dial with silver-toned hands and a date scale around the outer rim. 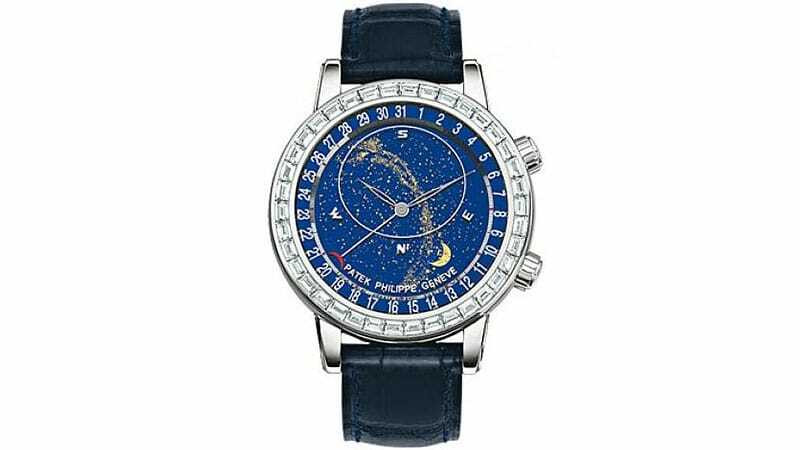 Additionally, the Swiss-made automatic watch boasts a moon phase function. Diamond watches for men come in a variety of styles, and for those who like a unique and edgy look, the Romain Jerome Steampunk Watch makes a perfect choice. 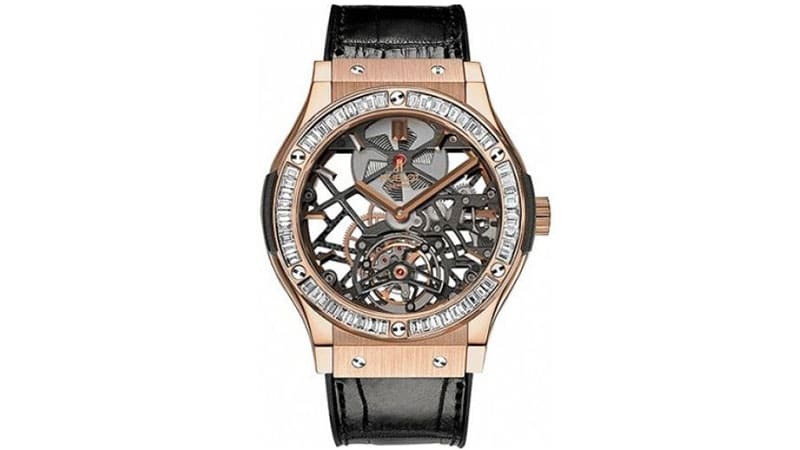 Its bold design features a large 50mm rose gold case with a diamond-set bezel and skeleton dial. 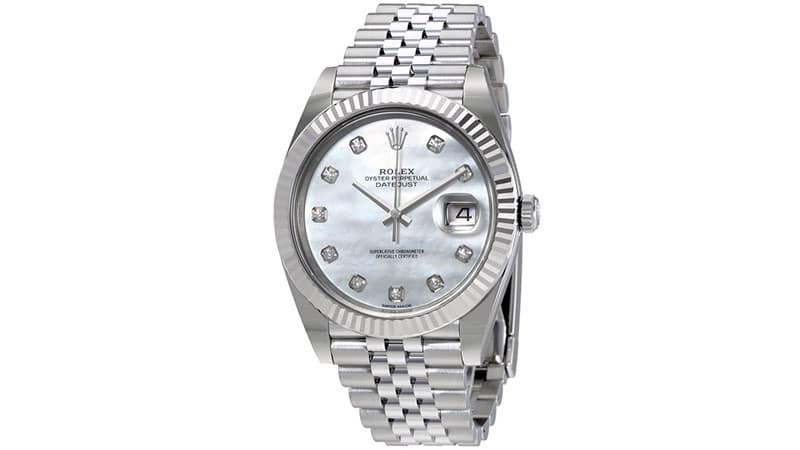 For those looking to purchase a luxury diamond watch, a Rolex is an obvious choice. The prestigious brand makes incredible timepieces, and its Oyster Perpetual Datejust Mother of Pearl Diamond Dial Watch is one of its best. The smart silver-tone design features a 41mm stainless steel case, fluted white gold bezel, and diamond hour markers. It also boasts an automatic movement with a 70-hour power reserve and is water resistant to 100 metres. Diamond watches for men can come in many shapes and styles. 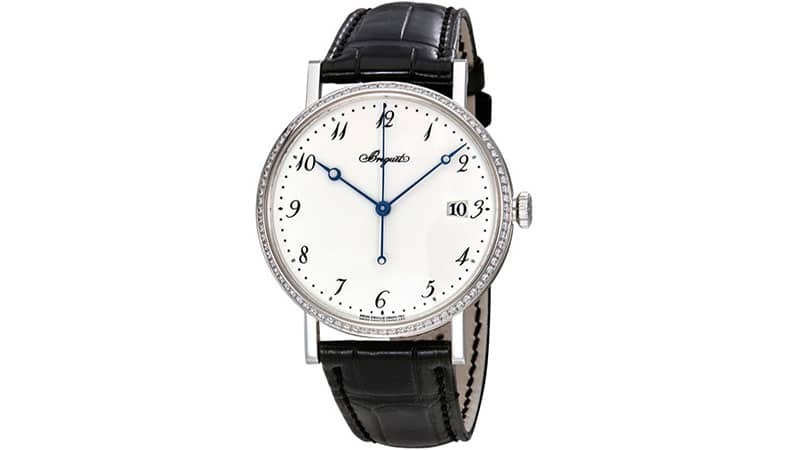 For those who prefer a traditional aesthetic, the Chopard Silver Dial 18 Carat White Gold Diamond Men’s Watch makes an excellent choice. Not only does it feature a smart, white gold, 40mm tonneau-shaped case, but it also boasts a fixed bezel set with diamonds and a black alligator leather strap. On top of that, the timepiece’s face is silver, and its dial markers are Arabic numerals. 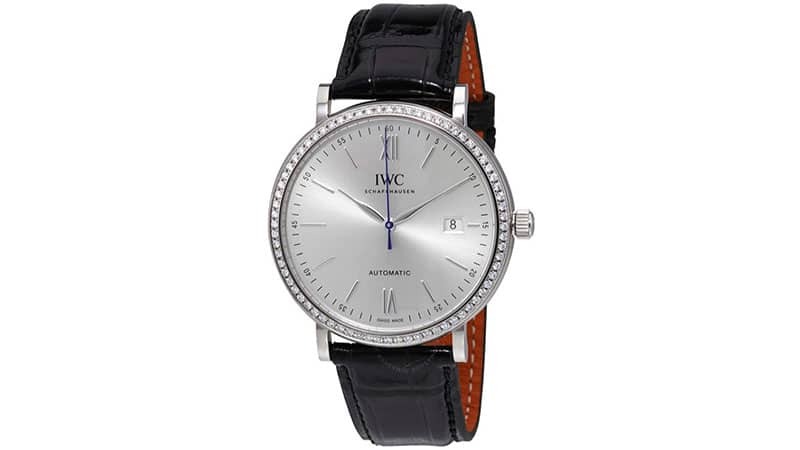 Whether you’d like a luxury look for the office or are after a sleek design for formal occasions, the IWC Portofino Watch makes a fantastic purchase. 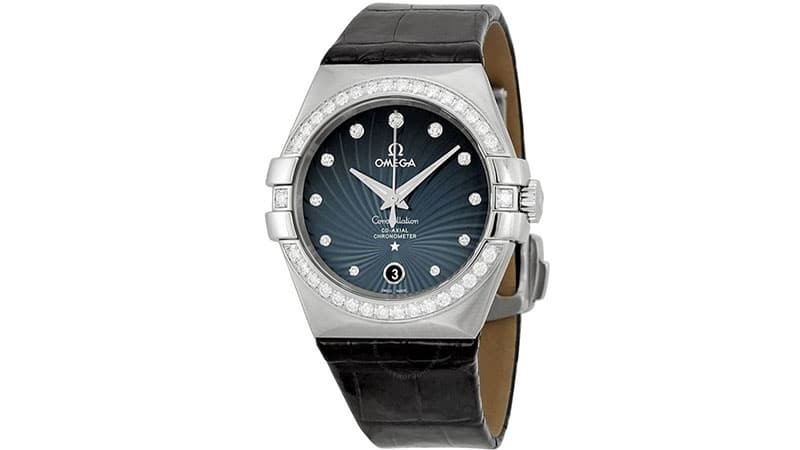 Boasting a silver dial and fixed bezel set with diamonds, this smart timepiece is sophisticated and stylish. Its functionality is also impressive, offering its user an automatic movement, 42 hours power reserve, 30-metres water resistance, and a date display. 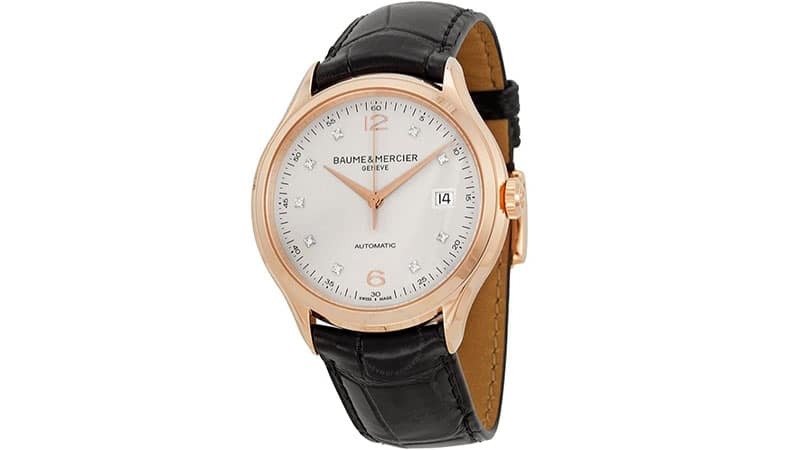 The timeless design is but one factor to love about Baume and Mercier’s Clifton Diamond Watch. The timepiece also features an automatic movement with 42-hour power reserve, date window, skeleton case back, and 50-metres water resistance. Not all diamond watches for men have to appear sophisticated and classic. In fact, some, such as the Bell and Ross Diamond Dial Watch, can look downright edgy. 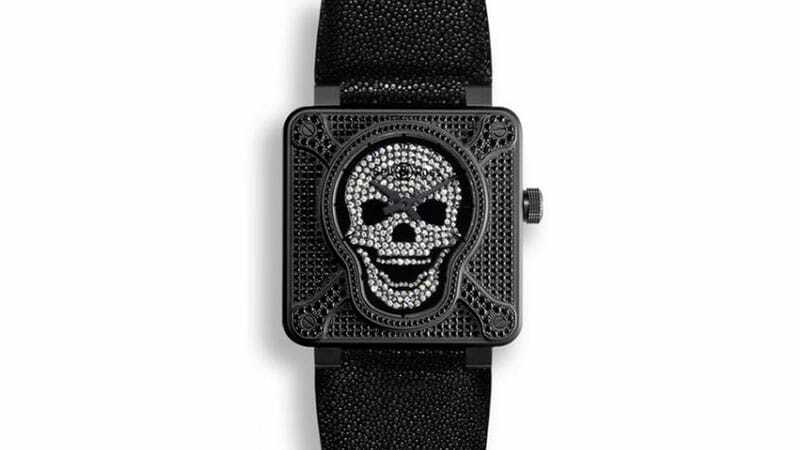 Featuring a 259 diamond-set skull motif dial and a black titanium 46mm square case with black diamonds, this timepiece is one for gents with attitude. Thanks to its black leather strap, blue dial, diamond-set bezel and diamond hour markers, the Omega Constellation Blue Diamond Dial Watch is perfect for formal evening events. As such, you can wear it at your next cocktail party or black tie function for a sleek and stylish look. There’s no need to worry about functionality either. The automatic Swiss-made timepiece is also a chronometer and features a date display at 6 o’clock. Diamond timepieces are luxurious, but they needn’t be showy. Piaget’s Altiplano Watch is but one example of a stylish diamond design that’s also minimalistic. As such, it’s the ideal piece for those who want a watch that’s grand without being gaudy. As well as being elegant, the Altiplano is also Swiss-made with an automatic movement, 40mm round case, fixed diamond-set bezel, and small seconds sub-dial. 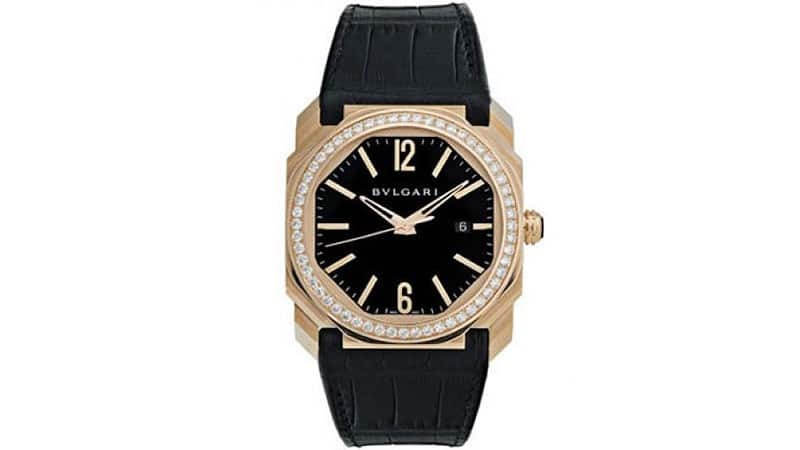 When it comes to diamond watches for men, Bulgari’s Octo 18k Rose Gold Diamond Watch is one of the best. The Swiss-made timepiece, which boasts a black dial, diamond-set bezel and unique octagonal 18k rose gold case, is both bold and timeless. 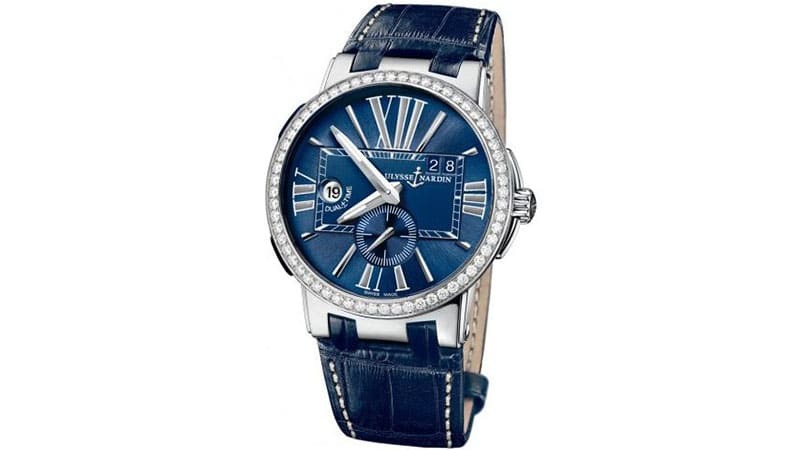 For the man who favours a traditional timepiece, Breguet’s Classique Watch is a fantastic choice. Not only does it boast an 18k white gold case and diamond-set bezel, but it also features a simple white dial with classic Arabic numerals. Vacheron Constantin’s Traditionnelle Manual Wind Watch is both luxurious and stylish. 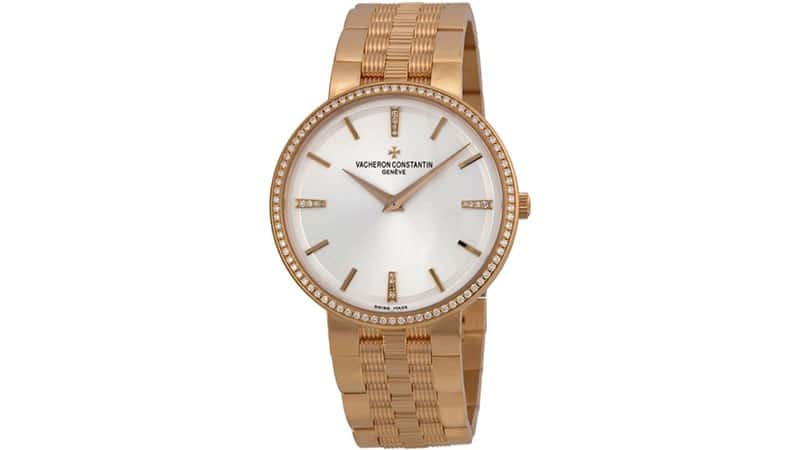 Combining 18k rose gold with 82 diamonds on the bezel alone, the sleek timepiece is well worth its five-figure price. Add it to your accessory collection, and you’ll always have a watch to wear for formal occasions. The Carl F. Bucherer Patravi EvoTec Watch is a uniquely stylish timepiece for gents. 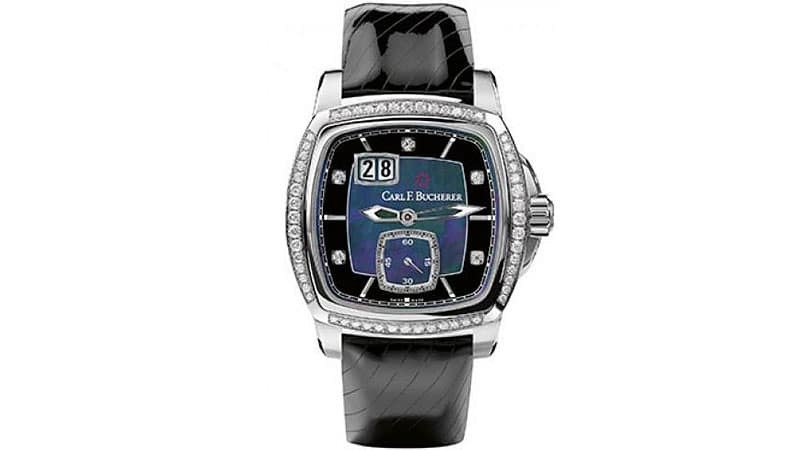 It features a cushion case shape as well as a black mother of pearl dial and diamond-set bezel. It also boasts an automatic movement with approximately 55 hours power reserve. Harry Winston sure knows a thing or two about luxury. So, it comes as no surprise that the label makes an impeccable men’s diamond watch. 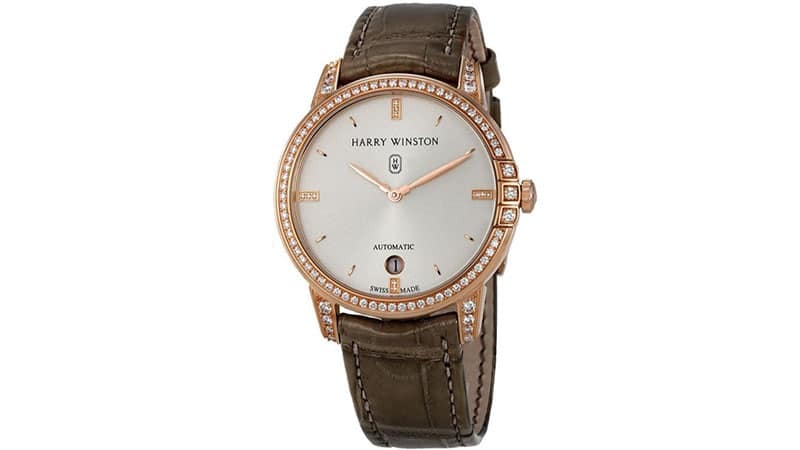 Known as the Harry Winston Midnight Watch, the smart timepiece is classically stylish and beautifully designed. It features a 36mm, rose gold 18k case, fixed bezel with diamonds, silver-tone sunburst dial, date display, and taupe alligator bracelet.